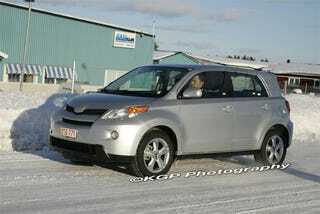 If you want to see the new 2009 Toyota Urban Cruiser in person you can either hop on a plane next month and head to the Geneva Motor Show — or you can just take a look at these spy photos of the new 'yota driving about sans camouflage on the snowy Swedish roads. Just like the press shot of the new Urban small-uv we've already seen from Toyota, these clear-as-day photos show us the Urban Cruiser will basically be a re-designed US-Spec Scion xD. The changes appear to be a big-time front fascia revision, including the addition of a new grille shape, a new front bumper, new fog lamps, and a revamped lower intake design. What carries over? The headlights. Read the full spy report below the jump. Cruiser, caught undisguise on the slick roads of Northern Sweden. responsible SUV", but the SUV claim seems a little shaky. sale in Europe later this Spring.